[GpW] has crossed the season's magical score limit of ladder 100 points, which means that no more ladders can be submitted. Unlike previous seasons, this season won't finish with play-offs, but the top 2 clans are invited to participate directly in the season's Grand Final, meanwhile clans ranked 3rd and 4th are invited to participate in the Bronze Final. Should one of the clans not accept the invitation, e.g. from top 2 clans, the clan ranked 3rd will be invited to the Grand Final and so on. The following clans are invited: [GpW] and CX for the Grand Final, -t3> and [CDF] for the Bronze Final. Clan leaders (or clan delegates approved by their clan leaders), please confirm in a comment here whether your clan will be participating. Please do so by February 1st, 22:00 GMT. §6.2 A clan that has reached a higher ranking during the season than its opponent, has the privilege of picking map order, team color order on every map (can choose team colors on overtime round as well) and is allowed to choose two (2) veto levels for the final/bronze match instead of one. §6.2.1 All clans will be allowed to change their previous veto level for the final matches. §6.2.2 In order to let clans prepare for this, the clans have to set their new veto level(s) at least 24 hours before the match is scheduled to start or immediately, if the match is scheduled to start in less than 24 hours. §6.2.3 The previous rule about the higher ranked clan being able to pick the tiebreaker map does not apply anymore, and the clans will have to follow the normal clanwar procedure on picking the tiebreaker. [10:49 PM] Jelly Jam: Hi, I vote for xlmbut, ezorb and xlmnidavellir and I recommend the last 2 to be 3vs3 only. Thus the 3 maps that have been selected for the mappool are Butrinti, Orbital IV and Sparkling Illusions! Congratulations for your victory Smoke & Loon! Your level truly impressed all of the judges. Also congratulations to FawFul and ThunDerDraGon for a tied 2nd place. The top-3 maps have now been added to the mappool, but Orbital IV as a 3v3 only map due to it's big size and complexity. Overall we got a total of 8 high quality, creative maps that were fun to play in during the judging process! That is way over my expectations! Therefore I want to thank everybody who participated in the contest! Also thanks to all the judges who voted and helped in judging the contest entries. -There are some areas that are particularly campy, namely the top middle and the large horizontal spaces. Luckily the bouncer ammo helps a lot in the horizontal space, but requires patience. -Contains two full NRG carrots that are very separated from each other, which means that each team basically has their own full NRG carrots. This makes it very hard to kill the opposing, dominating flagcarriers (especially in 2v2). -Contains a laser shield in an area that is hard (but not impossible) to reach out alive. Enabling /noshields neither stops the shield from spawning, but just makes players using that shield to get kicked off for using an invalid shield (apparently due to a JJ2+ bug). That would be too much for the ladder. The long-awaited stats and awards are finally up! [EGY]Kyro won the MVP award! All awarded players have an award on their profile now. Go and check it! No votes were received from CDF. Thus 2 votes were enough to pass a vote for a map. Fauztinville and The Dragon Eyrie have been added into the mappool as 3v3 only maps, due to their big size. The 13th season has now officially started! You may now play and submit ladder matches normally. The season lasts until 100 points as previously. Please remember that there won't be play-offs this season, but the top-2 clans will be invited directly into the grand final instead! The 3rd and 4th ranked clans will be invited to the bronze final. Also take note that the higher ranked clans will be able to veto 2 maps instead of 1 in their final game, as a reward. Best of luck to all the clans! May the odds ever be in your favor! The 13th season of the JJnet ladder is almost ready to start, and that brings in changes to both the mappool and and general rules. The updated rules are §2, §5 and §6 (plus rules related to them). §2.1 Clans with 20% or more of the maximum ranking points may not refuse clanwars (not ladder matches) against lower-ranked clans who have got at least 50% or more of the challenged clan's ranking points. §2.1.1 It does not matter if the challenging clan falls below 50% of challenged clan's ranking points after the challenge has been sent, as long as they had the amount at the point the challenge was sent. Clan A has got 80 ranking points, while clan B has got 20 ranking points. Clan B challenges clan A for a clanwar, but clan A may refuse without consequences since clan B has got only 25% of clan A's amount of ranking points. Clan A has got 99 ranking points, while clan B has got 50 ranking points. Clan B challenges clan A for a clanwar and clan A may not refuse the challenge (considering that it was the first valid challenge received by clan A) because clan B has over 50% of the amount of clan A's ranking points. Practically, clan B has ensured themselves being able to challenge any clan with 35 (due to rule §2.1.3) or more ranking points (as long as the maximum points to finish the season is 100). §5.1.1 Once all off-season clanwars have been dealt with, the two highest ranked clans will be invited to participate in the season final, and the 3rd and 4th clan will be invited to the bronze final. They shall start as soon as possible. In essence: Instead of play-offs, we are going to have just a bronze final and a grand final for this season. 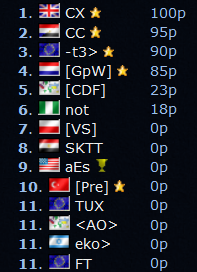 This should encourage clans to compete more for the very top spots in ranking to be able to win. In essence: Instead of being able to pick a tiebreaker map, the higher ranked clan is able to choose 2 veto maps for their last game (bronze or grand final). All clans are allowed to change their previous veto for the last game, but at least 24 hours before its scheduled start. The counts are indicating the total pick count during the on-season phase of the last season. The percentages are indicating the pick percentage out of all map picks. The new maps from voting/contest will be added shortly after the deadlines. You may view the latest mappool here. In addition to the current level contest, a few maps besides it are nominated for being added into the ladder mappool for the next season. The clans are allowed to vote for each map whether they wish to see it in the mappool. The clans that are eligible to vote are: CX, CC, -t3>, GpW, and CDF (more than 0 points last season and enough active players). Clanleaders, please send a PM to me on Discord by Saturday (September 1st) before 23:59 UTC with your votes. YES means the map should be added into the mappool. NO means it should not be added. Expect more major changes to the ladder mappool for the upcoming 13th season! More detailed news regarding the new season coming soon. Stay tuned!